Adam lay with his wife Eve, and she became pregnant and gave birth to Cain. She said, ‘with the help of the Lord I have brought forth a man. Later she gave birth to his brother Abel. In chapter 3 the serpent seeks an alliance with the man and woman in permanent rebellion against God. Part of the curse on the serpent is designed to ensure that no such permanent alliance will ever materialise. In 3:15 God puts a fixed enmity between the offspring of the woman and the offspring of the serpent – a state of sustained warfare. In this was he sought to frustrate the ideas of the evil one. Humanity will never be his obedient plaything. In spite of the fall into sin, humanity will retain a certain horror of evil, of the evil it commits even though it commits it. Each human being will know this sense of division within him or her self, but will nevertheless resist the snake. And above all, God prophesies the final and complete destruction of all the schemes of the serpent and ultimately its death when the seed of the woman will crush his head, at the conclusion of a long warfare. Chapters 4 and 5 give indication of how this warfare will work its way out. In chapter four we see the seed of the serpent, those who reject God and seek their own way. In chapter 5 we have the line of Adam through Seth, ultimately leading the Noah those who obediently follow God’s way. It appears that as we look at these two chapters there is something of the battle that rages in all of us. There is a part of Cain in us (chp 4) but there is also Abel. We are both together. The challenge of authentic Christian living is to see Cain crucified. There are very clear parallels in the Cain and Abel story with the temptation in the garden, but there are also differences. Whereas the alienation from God is present from the beginning here, when God refuses to accept Cain’s sacrifice. 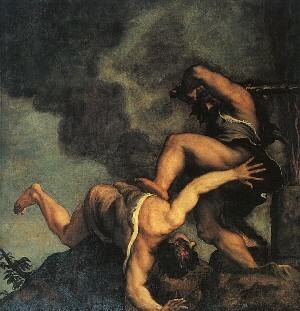 Eve had to be persuaded to disobey, but Cain, though given a chance by God refuses to take the Creator’s advice. Adam, Eve and the serpent accept their punishment without comment. Cain protests that his treatment is too harsh [Note: a victim mentality. We always feel we are being treated unfairly.] There is a development here, sin is more firmly entrenched and humanity further alienated from God.